Imagine the Northern edge of the Allegheny Plateau in Upstate New York, just east of Syracuse, twelve to fourteen thousand years ago as the Ice Age is coming to an end. The glaciers covering the land, which are composed of mind-boggling amounts of frozen waters thousands of feet thick are melting and receding, creating violent, massive torrents which necessarily carve a new landscape in their wake. Imagine enormous plunging waterfalls, taller than the waters of Niagara. 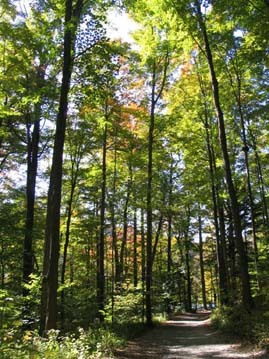 Now imagine a cool spring day in a beautiful wooded area of beech, basswood, maple, hemlock and tulip trees. Imagine a calm walk around a tranquil lake, whose water appears like a smooth reflecting glass on a calm day and is a color unlike any you’ve seen. Imagine an awe-inspiring spectrum of green, from the lush plant life that surrounds you, to the ever-changing waters of aqua-marine to emerald. Imagine an unspoiled place where you can see the progressive changes in vegetation, from swamp to forest, that are typical of this area of the country. Imagine the sounds of birds chirping, a woodpecker knocking, and the glimpse of a chipmunk, woodchuck or white-tailed deer trying to avoid your glance. Both of these visions are the things dreams are made of. Both are true, and one can still be witnessed. Near the small village of Fayetteville, New York lies Green Lakes State Park, undoubtedly one of Upstate New York’s best kept secrets. In 1792, 1.5 million acres of land were broken up into plots and given to Revolutionary soldiers to compensate for pay they had not received during the war. In 1816, David Collin III and his brother traveled from Columbia County near the Hudson with the deeds inherited from their father for 550 acres of land which surrounded two gorgeous, glacially formed lakes. The original property remained in this family until 1927 when, for preservation purposes, it was turned into a State Park. Originally 1000 acres were outlined for inclusion in the park plans. It took almost fifty years, from 1927 to 1975, for most of this original land to be acquired. Although there is very little written on the subject, there is certainly some interesting history connected to the park. During the 1930’s, in an attempt to alleviate some suffering during the Depression, the federal government implemented the Civilian Conservation Act, where young men built cabins in the park and worked there on park roads, maintenance and construction. For a short time after this period, the cabins were used to house homeless World War I veterans. During World War II the abandoned CCC camps were used for German prisoners of war. These prisoners planted flowers which were still blooming twenty years later, and remnants of these old gardens can still be seen. Today, the park consists of 1,835 acres of beautiful, protected land and is open year-round. The foremost attraction of the park is clearly its two lakes, Green Lake and Round Lake, which are stunning to say the least. The lakes are literally the plunge basins of Ice Age glacier melt waters, and today there is simply a tiny stream of water that remains as evidence of what used to be a thrashing river of violent natural energy. The majority of the shoreline drops off to very deep water very rapidly, providing a visitor with a spectacular view into deep crystal waters from the walking paths. The major exception to this rule is the northern end of Green Lake which is reserved for beach use and guarded swimming. When walking on the lake trails, one is cradled between the rich, vibrant, almost alien blue-green waters on one side and thickly vegetated, steep wooded inclines on the other. The surroundings appear like something out of legend. One almost expects an elf or fairy to be peeking at you from behind moss covered rocks. The color of the lakes is certainly striking. Its brilliance is due to a combination of light absorption, the depth and clarity of the water, and the presence of calcium carbonate at the bottom. The lakes are considered meromictic, which, put simply, means that their waters consist of multiple layers, each of which contain different chemistries and temperatures. Green and Round Lakes each have a small upper layer of water that is regular, mixing water where the majority of life occurs. Below this is a middle layer that does not mix, and a bottom layer which is a permanent layer of minerals. The layer of minerals prevents the water from turning over completely, which is an annual event in most lakes. There are only eleven known meromictic lakes in the United States, and these very lakes were reported as the first. Along the eastern edge of Green Lake, a short distance from the beach is a lovely reef area which looks almost as out of place in Central New York as the color of the water itself. Although many reefs can be seen around the lakes creating shallower areas along the edges, this spot, known as the Reef at Dead Man’s Point, is outstanding. Oftentimes, the reef breaks out of the water to quite a distance. Despite the foreboding name, Deadman’s Point is one of the most beautiful spots on Green Lake, and is surely worth a stop to take it all in. The stark white color of the reef coupled with the crystalline green waters makes for a purely tropical picture. This reef, as with all of the reefs around the lakes consists of a white, chalky material which is formed by living organisms. The reefs are a logical occurrence in an unusual landscape. When considering the mass amount of calcium carbonate in the lakes which is precipitated by bacteria, it begins to make sense. These deposits are technically referred to as microbialite, and it is probable that the process of their formation has been occurring since the lakes first came into existence. Although Round Lake is less than half the size of Green Lake (the Green Lake trail measuring 2.3 miles and the Round Lake trail at .8 miles) it is well worth taking the extra time to explore its own attractions. Round Lake can be approached by walking about halfway around Green Lake and veering West onto an obvious, although unmarked trail. Although the wildlife around Green Lake is relatively untouched, Round Lake is pristine in comparison. 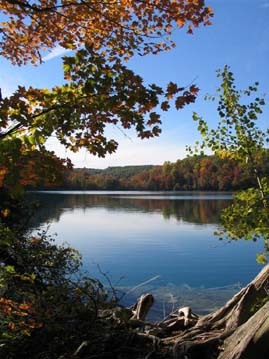 Round Lake has the distinction of being a National Natural Landmark. It received this designation in 1975 by the Department of the Interior after HW Voglemann, a professor of ecology at the University of Vermont, was so impressed with the virgin state of the lake’s surrounding forest and its impeccably balanced moisture system that he was inspired to write a recommendation. Today Round Lake, with the exception of the tasteful walking path surrounding it, is much the same as it ever was. On the southwest end of the lake there is a trail that leads into the woods where one can enjoy one of the finest representations of an untouched mature upland forest anywhere in the country. It is said that the Native Americans believed the lake was bottomless. When peering into the deep from the water’s edge, it seems likely, but Round Lake has been measured to be 180 feet deep, while Green Lake was measured at 195 feet. After a hike around the lakes, a trek that will take about an hour and a half to two hours at a leisurely pace, a short drive (or hike to those more adventurous) to the Green Lakes Golf Course club house is highly recommended. The par 71 course is beautifully manicured and was designed by the world renowned architect Robert Trent Jones. If you look carefully, his signature sand traps in the shape of a ball on a tee can be seen from the club house patio. Although the food and beverages available have been taken over by a local franchise in recent years, the clubhouse is still quite a nice place to sit back, relax and have a beverage or a cheap snack while taking in the breathtaking scenery. Sitting for a lengthy span of time sipping an iced tea or something a little more potent is certainly not frowned upon, unlike your average restaurant. The elevated patio faces north which allows you to look over the front side of the course with Green Lake at the bottom of the hills in the near distance. Armchair golf enthusiasts can enjoy watching golfers tee off at the first tee as well as finish out the ninth hole. Including the lake trails mentioned, Green Lakes State Park has over twenty miles of hiking and cross-country ski trails to explore. In addition to this, visitors will find 137 campsites available as well as picnic and grilling areas, a Frisbee golf course, a guarded sand beach and rowboat and paddleboat rentals. Mary Notarthomas is a freelance writer currently living in London where she manages the Court Restaurant at the British Museum. Orginally from Syracuse, New York, she has an undergradutae degree in History and a Masters degree in Social Anthropology from thje London School of Economics. Her passions are writing, travel, and photography.